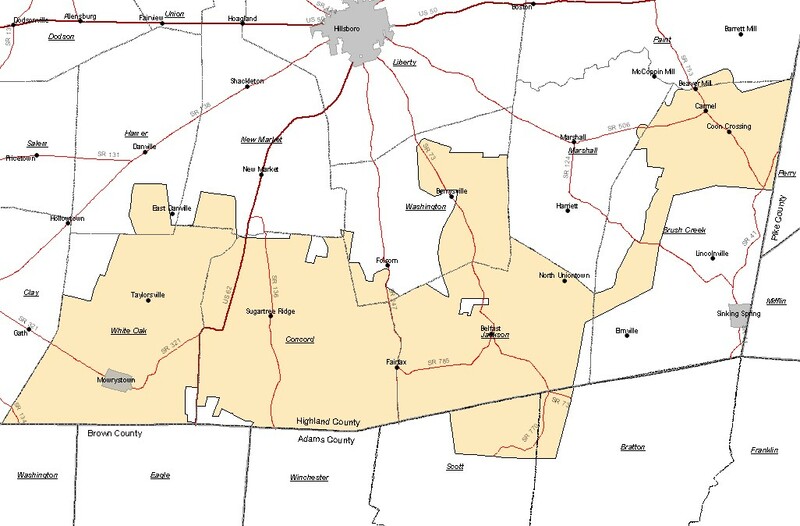 The old school districts of Ebenezer, Shaufner, Union, Taylorsville, Olive (Greasy), Mowrystown, Bells Run and at one time Dixie, Comprised most of the territory now known as Whiteoak Rural School District which today is composed mainly of Whiteoak Township and portions of adjacent territory in adjoining townships, plus a small part of Eagle Township in Brown County; some of this territory having been added since the former districts were made into the present one. The citizens of Whiteoak Rural School District and the members of the Board of Education are to be congratulated on their desire to conduct the processes of public education along modern lines and in accordance with modern changes, trends, and needs. This wholesome attitude toward educational values was appropriately shown when, on Tuesday, November 3, 1936, the voters went to the polls and by a majority of 75.16% voted a bonded indebtedness totaling $49,700 for the purpose of constructing a new elementary and high school building. A resolution submitting the issue to the people was formally acted upon by the Board of Education on August 31, previous to the date of election. On the second day of September , 1936, the State Department of Education at Columbus certified to the State Director of the Public works Administration as to the needs of a new building in Whiteoak Rural School District and on October 24, 1937, pre-approval was given by the Public Works Administration in Washington to the Application of the board of Education for a Federal Grant of $40,663 which supplemented the bond issue previously voted by the people; subsequently, the Board of Education received an Offer from the United States of America, dated September 26, 1937, and accepted the same on October 4, 1937 . Sealed proposals were then received and let for the furnishing of all labor and material for the construction of the building according to the plans and specifications prepared by the architects at one o'clock on December 3, 1937. Fifteen days after the bids were let, constructions started and the dead-line set for the completion of the work was officially established by the Government for October 16, 1938. Fortunately, however, the building was finished during the latter part of august, with the exception of the purchasing and installation of equipment. Prior to this date, the Board of Education began to consider the question of adequately furnishing the building and on June 17, 1938 asked for a Supplementary Grant from the Federal Government which was made some few months later and, although the equipment was not installed, school began on September 6, 1938 in the new building and by Christmas time all of the furnishings had been completely installed. The total cost of this project including the building, equipment, changes made during construction, and grounds was approximately $100,000. At the end of the first school year, the entire project was complete in every respect. with the exception of the landscaping, which was under way about one month prior to the closing date of school. There are many interesting facts connected with the construction of Whiteoak Rural School that might be related were it possible to devote space to these. There were approximately 400,000 bricks used in the construction, all of which were made in Mowrystown. Over fifty firms or organizations were associated with the Board of Education during the period of construction, these firms being located all the way from Louisiana to Michigan, and from Iowa east to Massachusetts. Men from five different states helped construct the building, and during the months that the project was under way, six men were slightly injured. The roof on the structure weighs approximately 100 tons, being supported by heavy steel joist overlapped by gypsum slabs. The water supply comes from a well surrounding a well! The school lot is one of the finest in the southern part of the state of Ohio, containing approximately ten and one-half acres of playground which allows sufficient room for all school sports and activities of an outdoor nature. After the masonry work was finished the building received a complete scrubbing both inside and out; the outside surface being washed down by acid and the inside glazed corridor brick with vinegar! The building is absolutely modern and complete in every respect, containing, among other things, the latest equipment for heating, which includes an automatic stoker and individual thermostatic temperature control for each room; a completely sanitary sewage disposal system, with gang showers and wash basins; individual lockers for each student; basketball backstops with a swing-up stop above the stage; Lincoln type science desks with storage cases and fume hood; over head hoist and door in the shop room; electrical equipment throughout Home Economics department; special music room; built in library shelves combined with the study hall; a drive around the building with appropriate parking space in the rear; superintendent's office surrounded by outer office, book storage room, waiting room, and rest room; telephone with extension line to the second floor; fire-proof protection booth room; and supervisory control unit, together with a standard and shortwave radio band, with an automatic phonograph record changing mechanism. The citizens of this district are undoubtedly unaware of the many, many hours of labor the members of the Board of Education gave freely, ungrudgingly, and unstinted in order that this community might have one of the most modern school plants found in the southern part of the state. Congratulations and every good wish to each member of the Board of Education whose high ideals and noble purposes made such a community memorial possible. May it ever be remembered that the better purposes of education are only accomplished through the combined efforts of the citizenry of the community whose outlook reaches far beyond the horizon, and who, in turn, were far-sighted enough to select men for members of the Board of Education whose good business acumen, balance, and judgment has helped to erect the present outstanding community landmark. Thanks should go to those business men of this community and elsewhere who have made this dedicatory memorial possible, and who by their unstinted actions and assistance in financially supporting an undertaking of this nature, have made possible an indelible story that will live, both by picture and word, throughout the years to come.